can BigClouT platform collect comprehensive city data to better understand the city? City officers have daily works, for example garbage collection, road management, environmental management, etc. In those works, they have to collect/share city information. Currently, city staffs usually use legacy technologies such as telephone or FAX to collect/share such information. However, using such old technologies is not the best way for collecting/sharing information. It is sometimes inefficient and information is not stored as analysis-ready format (they usually use paper document to store the information). In this trial, we enhance their daily work more efficiency, and combines with city sensing opportunity. 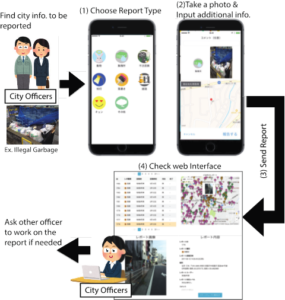 -Easy integration with the daily responsibilities of city employees: To enhance their daily work by such sensing, the tool must not disturb their current daily activities and must efficiently support them. -Easy usage: Since most city employees are not information technology experts, our tool must be easily understood and simply leveraged. -Providing reliability, dependability, and security: The tool must be used in daily city functions, which sometimes provide critical services for citizens. Reliability and dependability are also needed for it. Since city tasks often deal with the private data of citizens, data must be securely protected. We implement a system called MinaRepo to fulfill the above requirements by using BigClouT platform. As shown in the Figure 1, in MinaRepo, city staff possess smart devices. When they find city information they wish to share among other officers, they open MinaRepo application and take a photo of the information. Then, they post the report with some explanation to MinaRepo server. Finally, city officers can recognize latest city information and make a plan to deal the information (if necessary). We have tested a first prototype of MinaRepo with garbage section in Fujisawa city. In the second year, we plan to provide MinaRepo to further sections, and/or even other cities such as Chigasaki city or Samukawa city. By collaborating with other cities, we evaluate MinaRepo’s advantage more clearly.